THE BABADOOK, an old-school horror movie with fresh psychological ambiguity. A monster without created from a monster within. One night, single mother Amelia (Essie Davis) reads a strange bedtime story called The Babadook to her over-imaginative son Samuel (Noah Wiseman) that involves the ambiguous titular character pursuing them “until they’re dead.” Alarmed that the book would give her son nightmares, she hides it above the closet. Soon enough, strange events start: noises, knocks (as described in the book, “Ba ba ba dook dook dook”), hallucinations, screaming darkness, creeping visions, and Samuel whining “Muuuuum! Mummy! Mummeeee!” so pitch-perfectly you kinda want him killed… Intertwined with Amelia’s disintegrating patience with her loud son are soul-shattering remembrances of her late husband. Until she – and we – cannot discern what is real, what is waking dream, and what is babadook. Written and directed by Australian Jennifer Kent (her feature film directorial debut – respect! 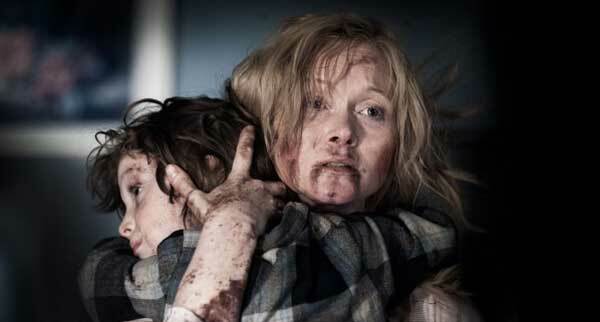 ), THE BABADOOK is a master class of suspense; the plot is simple, the cast is sparse, the location is mainly one house. Taken at face value, THE BABADOOK is tension from beginning to end; an atmosphere as taut as piano wire, with great traumatized acting from Davis, extremely effective, dynamic use of soundtrack, and scares which raise the hairs on your little cucumber legs. Taken metaphorically, it is gargantuan. 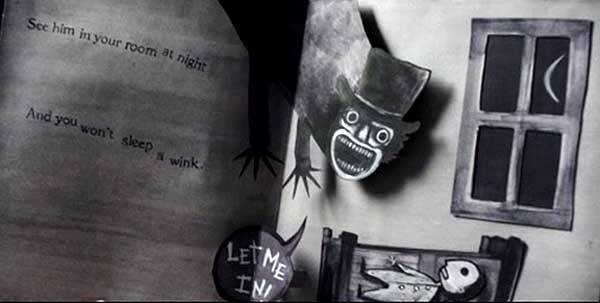 Though we see funny little drawings of the creature in the pop-up storybook, the Babadook is never seen clearly in Amelia’s visions. You can call it many names: grief, loneliness, regret. And it resides in shades of black beneath your public face. How deep have you buried it? It rears a peeping head here, a curved claw there, interrupting your reveries and responsibilities at the most inopportune moments. On the TV. On the roof. In the corner where the light never reaches. And if you let it gain a foothold, it comes more often, and bigger than the last time. If it surfaces completely, how extreme would be its manifestation in your reality? How wrenching your torment? How guttural your scream? Starring: Essie Davis, Noah Wiseman, Hayley McElhinney, Daniel Henshall, Barbara West, Benjamin Winspear, Chloe Hurn, Jacquy Phillips, Bridget Walters, Tony Mack, Carmel Johnson.